The 0928-29 is the ultimate combo kit for those who demand extreme power, superior performance and the longest running cordless tools. 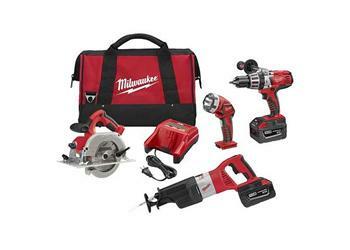 The 0928-29 features the revolutionary 28 Volt LITHIUM-ION battery pack exclusively from Milwaukee. The 28 Volt battery pack is the ideal solution for heavy duty cutting, drilling and driving needs. The Milwaukee 0726 28 Volt 1/2 in. Hammer-Drill uses the Milwaukee built high power motor to develop an enormous 750 in. lbs. of maximum torque and 0-450/0-1800 rpm. The 0726 comes standard with a 1/2 in. all-metal, single-sleeve, ratcheting chuck with all carbide jaws that keeps bits from falling out and drill bits from slipping. A comfortable non-slip, soft-grip handle reduces vibration and fatigue. The 0719 28 Volt Sawzall® Reciprocating Saw produces an amazing amount of cutting power. The variable speed trigger provides two levels of speed range: 0-2000 and 0-3000 strokes per minute. The 0719 also features a 1-1/8 in. stroke length, QUIK-LOK® blade clamp, patented gear protecting clutch, and keyless shoe adjustment. The 0730 6-1/2 in. Circular Saw has the most power of any cordless circular saw, enough to cut over 300 2 x 4's on a single charge! The 0730 has a left-side blade for increased cut-line visibility, 4200 rpm for extremely fast cutting, 50° bevel capacity and all-metal blade guards. The 49-24-0185 Work Light features a high intensity Xenon bulb, is Clip-Lok® System compatible and delivers over 5-hours of run-time on a single battery.